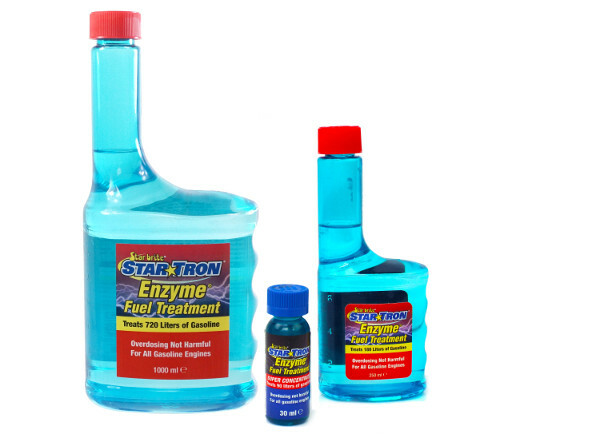 Created by Star Brite, Star Tron is one of the most effective products on the market for treating ethanol-related problems, and with 10% ethanol petrol soon becoming the norm in the UK, it will be more useful than ever. This revolutionary fuel additive is based on natural enzymes, which help to keep your fuel delivery system clean and petrol fresh. Treated with Star Tron, your engine will start up easily and run smoothly. Fuel burns more completely, increasing your machine's performance while providing great fuel economy and reducing smoke and all other emissions. Ethanol attracts moisture and can form an ethanol-water combination which falls to the bottom of your tank. This condition, known as phase separation, leads to gunk forming in your tank. Star Tron not only prevents gum, carbon and varnish build-up that can clog carburettors and fuel injectors, it removes it. It's also perfect for treating old fuel, making it particularly good for those who choose to put their bikes away for extended periods of time and can be used as a preventative measure beforehand for greater peace of mind. A little goes a long way, but Star Tron's special blend of enzymes makes it impossible for you to overdose your fuel. Learn more about Star Tron in Star Brite's Fuel Treatment Training Video.